When you want something fresh and healthy, a great choice is choosing the gyro. Often mispronounced (proper pronunciation here), it's a great way to get protein and vegetables. Served with tzatziki, a yogurt-based sauce, it's also full of flavor. The word gyro literally translates to turn in Greek. Typically the dish is made of meat (usually beef, veal, mutton, pork, or chicken) cooked on a vertical rotisserie served in a pita with tomato, onion, and tzatziki sauce. A couple months ago I discovered a gyro food truck near a job I was working. The next day I was on the web seeking out a gyro recipe to try at home. I don't have a rotisserie or spit on my grill so it needed to be something I could do easily. I stumbled across Tide & Thyme's recipe and gave it ago. DELISH! I even followed her recipe for tzatziki. I've now made it a few times and really the only changes I've made is what I put into the sandwich. As you can see in the photo, I included some shredded red cabbage to the shredded lettuce, and omitted the cucumber since there was already a good amount in the tzatziki. I warmed the pita on the stove (as you would for tortillas for tacos) to help wake up the bread (you could even toss it on the grill for a couple seconds). The other trick I did was to tear off a square of foil and build the sandwich on it and then use it to roll the gyro up nice and tight. It makes eating it a lot easier, plus you get that food truck feel. Listing this here for posterity, but check out Tide & Thyme's blog - there are some other great things there too! 1) Combine garlic, lemon juice, vinegar, olive oil, oregano, salt & pepper with whisk or fork in bowl or ziplock bag. Add chicken, thoroughly coat with marinade, and place in fridge to marinate for at least an hour. 2) Grill or cook in pan until browned and cooked through. After resting, slice into strips or shred. 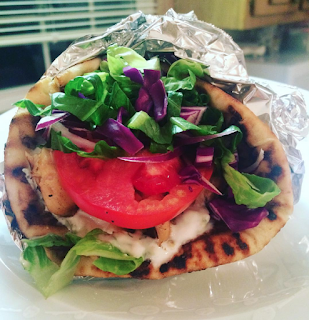 3) Warm pita then top with chicken, tzatziki, and veggies. 1) Shred or grate cucumber (I like to use my food processor). Then place them in a clean kitchen towel and squeeze to remove as much moisture as possible. 2) Mix yogurt, cucumber, garlic, vinegar, lemon juice, dill, salt & pepper together and refrigerate to let flavors blend together. 3) Enjoy. It makes a lot, but if you have leftover from gyros, it's a great dip for veggies too.